Thanks to Nancy Allison for this pointer to an article from the Seattle Times about Tim Hetherington. One thing though, I’m not sure that it is entirely accurate to refer to Tim as a “war photographer”. He worked long-term on projects highlighting humanitarian issues and had an approach to documenting conflict and its repercussions that seems to extend beyond the commonly-held notion of a ‘war photographer’. In an interview I did, see excerpt from PDF to download, Tim Hetherington he touches on this. I will try and locate the entire interview and upload it as soon as I can as it covers some of these points. From the interview, Hetherington says: “People are continually lumping things together,” he continues. “For example, people call me a ‘war photographer’ which I find quite interesting… What I have a problem with is people putting me into the photojournalist expeditionary core of someone who is moving around the world taking pictures of violence without thinking about what I am doing”. Press statement about Guy Martin from Panos Pictures who was seriously injured. I just got this through and am posting in its entirety, my internet is limited in the desert. Following the reports on the death of Tim Hetherington a conflict photographer who was a director and producer of the Afghan war documentary “Restrepo,” in the besieged city of Misurata, Libya, on Wednesday, and that three photographers working beside him were also wounded when they came under fire. Chris Hondros of Getty Images later died in hospital from his injuries. One of the other two photographers who was seriously wounded is now recovering in hospital in Misurata is Guy Martin who lectures on Press & Editorial Photography at UCF. His partner Polly Fields, a former student at UCF received a Distinction for her MA in International Journalism and won one of only 5 International Committee of the Red Cross (ICRC) Young Reporters Awards as part of her Masters is in contact with University College Falmouth with updates. 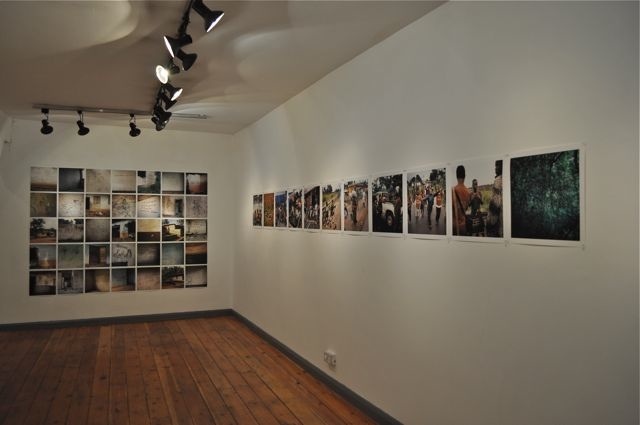 Today’s post features a show review by Newcastle University student, Katie Lin, of Long Story Bit by Bit: Liberia Retold – an exhibition of photos by Tim Hetherington. This time last year, HotShoe carried an interview I did with Hetherington about the same body of work. Follow this link, HotShoe April/May 2009 for an excerpt from the feature. If you are interested, there are a few back copies of this issue available from HotShoe’s main office.